The language school EC English was founded in St. Julians, Malta in 1991. The centre is located in St. Julians, a charming tourist resort built around a small bay. It is Malta’s entertainment capital with restaurants, bars, night clubs, shops, a cinema, a casino, a shopping centre, a sandy beach and a bowling alley - all within a few minutes’ walk from the school. This course is 20 lessons of general English and 10 classes of English for work. 2019: 22.Jun.2019, 29.Jun.2019, 06.Jul.2019, 13.Jul.2019, 20.Jul.2019, 27.Jul.2019, 03.Aug.2019, 10.Aug.2019, 17.Aug.2019, 24.Aug.2019. 2019: 24.Jun.2019, 01.Jul.2019, 08.Jul.2019, 15.Jul.2019, 22.Jul.2019, 29.Jul.2019, 05.Aug.2019, 12.Aug.2019, 19.Aug.2019, 26.Aug.2019. 2019: 22.Jun.2019, 29.Jun.2019, 06.Jul.2019, 13.Jul.2019, 20.Jul.2019, 27.Jul.2019, 03.Aug.2019, 03.Aug.2019, 10.Aug.2019, 17.Aug.2019, 24.Aug.2019. 2019: 22.Jun.2019, 29.Jun.2019, 06.Jul.2019, 13.Jul.2019, 20.Jul.2019, 27.Jul.2019, 03.Aug.2019, 17.Aug.2019, 24.Aug.2019. 2019: 07.Jan.2019, 01.Apr.2019, 01.Jul.2019, 23.Sep.2019. Note: All courses offered by EC English, St. Julians can be reserved online with LanguageCourse.Net. In case a course is not listed above, just mention the course description in the comment field of the online registration form. Individual classesSingle individual lessons of tuition can be reserved at 55 €. The combination of group and individual lessons is highly recommended. Individual lessons will encourage you to actively speak the foreign language and will offer you the opportunity to discuss individual problems and weaknesses. One-to-One tuition: A minimum of 2 lessons applies. Lessons may alternate between morning and afternoon sessions. Minimum age is 16 years old between 01.01 and 06.04, 29.04 and 21.06, 01.09 and 27.09, 27.10 and 31.12. Student insurance: EUR 10 (per week). Bank transfer fee: EUR 20. Unaccompanied minor fees: EUR 30 (one way). The following courses are separate for students over 30 years of age: English for Work, English in the City, Business Mini Group and Intensive Business Mini Group (prices are the same). Pay-per-Use air-conditioning facilities are available in the apartments. This accommodation option includes airport pickup. Bedding/linen, Weekly cleaning, Access to laundry service, Kitchen, Access to Wifi in building (Free WIFI), Air conditioning, No meals, Shared bathroom. TV, Towels, Bedding/linen, Weekly cleaning, Access to laundry service, Breakfast, Shared bathroom. TV, Towels, Bedding/linen, Weekly cleaning, Access to laundry service, Access to Wifi in building (Free WIFI), Breakfast & 1 meal, Private bathroom. TV, Towels, Bedding/linen, Weekly cleaning, Access to laundry service, Access to Wifi in building (Free WIFI), Breakfast, Private bathroom. TV, Towels, Bedding/linen, Weekly cleaning, Access to laundry service, Kitchen, Access to Wifi in building (Free WIFI), Air conditioning, No meals, Private bathroom. Students have to pay for air-conditioning. This accommodation option includes airport pickup. TV, Towels, Bedding/linen, Weekly cleaning, Access to laundry service, Kitchen, Access to Wifi in building (Free WIFI), No meals, Shared bathroom. Towels, Bedding/linen, Weekly cleaning, Access to laundry service, Kitchen, Access to Wifi in building (Free WIFI), Air conditioning, No meals, Shared bathroom. 0,50 EUR per night to a maximum of 5,00 EUR per continuous stay. Students aged 16-17 must book homestay/single room and require a parental consent form. Apartments: pay-per-use air-conditioning facilities are available in the apartments. Insider tips about what future students should not miss: The first day they gave us all the information projecting a power point presentation that however has not been given to us. I would suggest a manual richer in information, the one received was a little bit thin. The drivers who accompanied us in the transfer from the airport to the apartments and vice versa, often they didn't know the addresses of the accommodations. Other comments: Overall the judgment is good. The only comment is about the personnel of staff, that sometimes was a little bit rude. 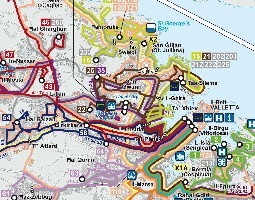 Insider tips about what future students should not miss: It's important to live more or less near to the school, because public transport in Malta is horrible. If you live near to the school is easier to use the Internet area, the EC Beach Club or the gym when you want. Insider tips about what future students should not miss: Come to school in right time. Do you know someone in particular with whom you would love to explore life in St. Julians? Just tag them in your post to Facebook or send them a link to this page in a message or email.